Join CopsAlive next Thursday July 30th for a live interview with Kelly Young widow of slain Denver Police Detective Donald “Donnie” Young (E.O.W. May 8, 2005). 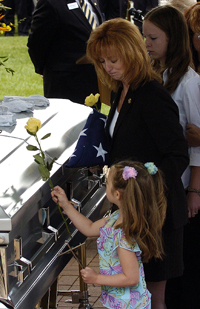 Detective Young was killed in the early morning hours on Mother’s Day 2005 while working off duty in uniform at a private baptismal celebration. Young and his partner had asked some young men who were trying to crash the invitation only event to leave, and they became combative, so they were escorted out by Detective Young. A short time later one of the men came back to the party with a gun and shot both police officers from behind. Young was shot twice in the back and once in the head and was killed while his partner, Detective John “Jack” Bishop was wounded but saved by his bulletproof vest. The suspect 19 year old Raul Garcia-Gomez fled the United States to Mexico and was involved in a lengthy court battle… to get him returned to the U.S. for trial. He was returned and stood trial and was convicted of the Second Degree Murder of Detective Young and First Degree Attempted Murder of Detective Bishop. He is now serving an 80 year sentence in prison. In order to get Garcia-Gomez extradited to the U.S. an agreement had to be reached between the U.S. and Mexico that the suspect would not be subjected to the death penalty. As a result of this case, Colorado Representative Bob Beauprez introduced legislation before the United States House to cut foreign aid to countries that refused to extradite people suspected of murdering American law enforcement agents. The provision was part of a 2006 foreign aid bill signed into law by President Bush in November 2005. We will be lucky indeed to have a chance to hear from Kelly about her experiences as a police officer’s wife and what she went through following his death. Join CopsAlive on Thursday July 30, 2009 at 2 PM Mountain Time to listen in live to this interview. If you would like to listen to our interview please click the replay button below or RIGHT CLICK HERE to download (that’s CONTROL CLICK if you use a Mac then SAVE LINK AS…) a copy of the mp3 file. Kellie, your friends here at El Paso County still think of you and the girls often. We miss Donnie and still tell the many funny stories he blessed us with. We love you and wish you well. Tonia…just saw your post and my heart goes out to you. I lost my brother-in-law in April in the line of duty. Please let me know if you would like to talk with my sweet sister…. You are in my prayers…nothing about this grieving process is easy. I just opened this page. I wished I had known about your husband’s death, not that it will make any easier for you, but I would have passed on my condolence as I do now. I am going to send a contribution to COPS, but, I would like for you to send a thank you note to, Mrs. Marcella Andrea Aguirre-3419 Pennsylvania Common-Fremont, CA 94536. She sent that amount to me, I feel COPS deserves it and much more. It was pleasure meeting you on May 7th. Hope we meet again. Fidel Aguirre Jr.